Cairn Terriers are a small, rough coated breed from Scotland. They stand approximately 10-12″ at the shoulder and should weigh about 15 – 16 lbs. They are lively, active, loyal, bright and have a great sense of humour. They are not an off-leash dog, as hunting is instinctive in this breed and would be their first priority when running free. Cairns are a reactive dog and may respond to certain stimuli with barking — i.e., cats, squirrels, door bells. They are generally hardy and long-lived, most until 12-15 years. They require moderate grooming, daily exercise and the love and attention of a family or owner. Shedding is minimal if the dog is brushed weekly and given a thorough grooming every 3-4 months. Coats can either be hand stripped (the dead hair is removed/pulled out with a stripping knife or by hand) or clipped. Only the hand stripping method of grooming will keep a Cairn in a typical “rough” coat. Stripping versus shaving your pet Cairn’s coat is a matter of personal choice. Cairns are diggers if given the opportunity – too much time alone in the backyard for example. They are a “big dog in a little package”, meaning they won’t go looking for trouble, but if they are challenged, they won’t back down. They are clowns and love to amuse their owners. They are enthusiastic ball players. At CABARET CAIRNS, all my litters are home raised and the cost of a puppy includes one or two sets of vaccines (depending upon the age of the pup when you take him/her home) and the implantation of a micro-chip. Puppies are examined by a veterinarian and registered with the Canadian Kennel Club. All litters are tested clear at Guelph University for PSS (Portal Systemic Shunt), a liver disease that can affect Cairns. Official CKC papers are included with the purchase. All puppies are sold with a CKC non-breeding contract, unless other arrangements are made at the time of purchase. With each breeding, I hope to produce a better dog. There is always a goal behind the mating of one of my females. I am trying to keep my Cairns healthy, happy and structurally sound. I belong to the Cairn Terrier Club of Canada, The Cairn Terrier Club of America and the Canadian Kennel Club. I am also a member of the Association of Pet Dog Trainers (U.S.), the International Positive Dog Trainers Association and have been the director of PAWS-ITIVE PUPPIES for seven years. PAWS-ITIVE PUPPIES is a family oriented puppy school with classes held in veterinary clinics in the Greater Toronto area (see “PAWS-ITIVE PUPPIES” section for further details). As part of my placement agreement, all puppies must be taken to puppy classes with their new families. I would be happy to assist you in locating a suitable puppy program to register with in your area. Socialization is an important factor to raising a happy, well-adjusted dog — and it sure helps the humans to learn a few solutions to puppy shenanigans! At CABARET CAIRNS, I produce only one or two litters per year. This translates to the birth of approximately eight puppies. On the average, I receive at least five requests per week for puppies. I am in the fortunate position of being able to be very selective when placing my babies. Most litters have a waiting list before they are born. If you are interested in getting more information about a CABARET CAIRN puppy, please contact me via email (See“Contact Us“). For further general information about Cairn Terriers, visit www.cairnterrier.org. Note: Look for CABARET CAIRNS in the Browntrout Cairn Terrier calendars — Tucker is featured in 2013 Browntrout Calendar in the month of August. Tucker was also on the cover of year 2000 and Rosie for 2001. Tucker returned as the cover-boy for 2003. Zoe and Rose are featured in the 2004 calendar. Rosie graced the cover again in the 2005 issue. My Cairns have also modelled in the 2010 Dogs in Canada Annual magazine, as well as on line as the breed representative for both Canadian Kennel Club Cairn Terrier breeder listing and Canadogs Website. We also offer grooming services (hand stripping) for Cairn puppies. For more information about grooming a Cairn, visit our Grooming page. 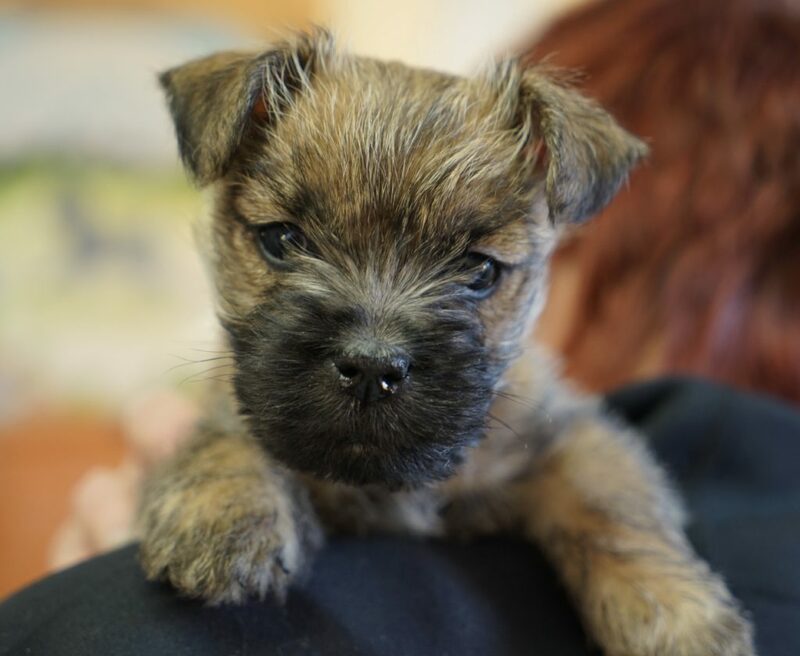 If you would like to see pictures of our Cairns, old and young, please visit our Picasa Photo Gallery or Our Cairn Terrier Family. We also have lots of photos of our puppies with their new families on our Facebook Page: www.facebook.com/cabaretcairnterriers. You will find Cairns come in a variety of colours, from striking light wheatens to rich dark brindles. Enjoy! Newborn puppies, Chloe and Beans play in the back yard. Cabaret Cairns has been featured on television with both CTV News and Local News Stations.